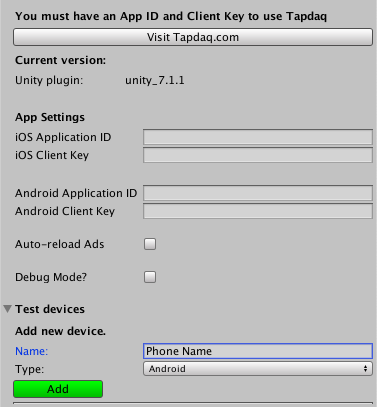 Tapdaq's mediation debugger enables you to test your SDK integration. You can specify and test different ad types from each ad network you have integrated to ensure you are receiving ads as expected. Please note, for the debugger to work you will also need to have input the correct ad network keys on the Tapdaq dashboard. Export your build and run your application, you should have a popup appear with a list of networks to test. Export your build and run your application, you will now see test ads for AdMob and Facebook. I/Ads: Use AdRequest.Builder.addTestDevice("4D32C4G30407EPC0EBB847E0E2694ACE") to get test ads on this device.